A new way to add texture & design to metal. 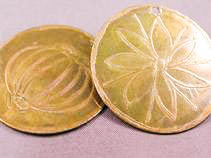 Draw or stamp a design on copper or brass sheet metal & use a salt etching solution to cut your design into the metal. Learn the basics of how to choose metals, the setup of your etching bath, and how to create or transfer your images with resists. We will cover, etching safety, chemical disposal as well as design considerations.